A photograph is commonly understood to act as a window, crystallizing a subject or moment in time. Artist Marco Breuer, however, subverts this traditional understanding of the medium, exploring the inherent limitations of photographic materials rather than using them to record the world outside. His work employs radical techniques that do not rely on the use of a camera, aperture, or film, and investigates the potential of the photograph as an object unto itself, beyond its ability to represent notions of external reality. Marco Breuer, Untitled (Heat/Gun), 2000. Gelatin silver print, burned, 12.5 x 9.75 inches. © Marco Breuer. Breuer will discuss the conventions of the photographic medium and his deliberate misuse of its fundamental materials on Thursday, March 31, at 7 p.m. Breuer’s work is featured in the exhibition Look Inside: New Photography Acquisitions. This program is free and open to the public, but donations are welcome. Seating is first-come, first-served, and doors open at 6:30 p.m.
Members are invited to join us for a reception at 6 p.m. All attendees may enter to win a copy of Light, Paper, Process: Reinventing Photography by Virginia Heckert and a camera-shaped coffee mug. In anticipation of Breuer’s visit to the Ransom Center, we asked him to discuss what his work means to him. The beauty of photography is that it materializes in so many different forms. I look at photography in all its manifestations: from utilitarian images made for insurance purposes to early experiments with light-sensitive materials. I am intrigued by the idea that the early practitioners were making photographs without ever having seen a photograph. But the real answer is: work generates work. A good piece is one that triggers the next. What do you hope to convey through your work? My work is an exploration of the fundamental questions of photographic form and practice. Every individual piece constitutes a search, a move away from the given, a test of the materials’ limits. One of the core issues of the photograph is the window vs. object tension. Surface violation complicates that issue and creates a cognitive dissonance. Many of my processes are subtractive in nature: the photograph is dismantled, the glossy surface scraped away to reveal the raw substrate. The relationship is called into question: image and support are inseparable, literally fused. How do your works speak to the nature of photography in a way that traditional photographs cannot? I studied photography at two rather traditional schools in Germany. After graduation I didn’t like what I was seeing in photography, and began to work in opposition. But that is not a sustainable mode. At some point you have to make your own decisions. 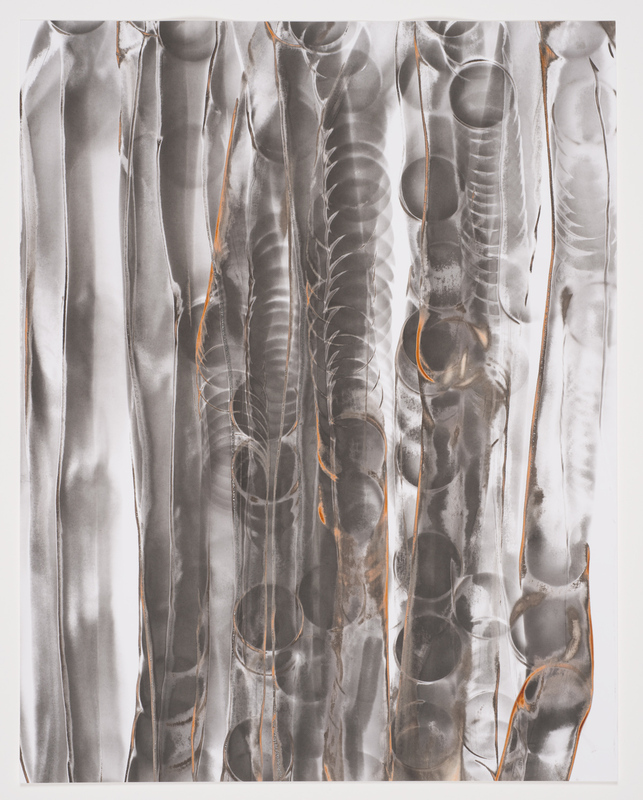 I chose to work with the photogram as a starting point and then began to strip that down further: eliminating objects, light sources, etc., making photography a physical act, and every photograph a record of a physical interaction. This approach allowed me to get to a type of photography that has the immediacy of a pencil drawing.